Sandy Ikeda and I have published a new Mercatus paper on the regressive effects of land use regulation. We review the empirical literature on how the effects of rules such as maximum density, parking requirements, urban growth boundaries, and historic preservation affect housing prices. Nearly all of the studies on the price effects of land use regulations find that — as supply and demand analysis would predict — these rules increase the price of housing. While the broad consensus on the price effects of land use regulations is probably to no surprise to Market Urbanism readers, some policy analysts continue to insist that in fact rules requiring detached, single family homes help cities maintain housing affordability. 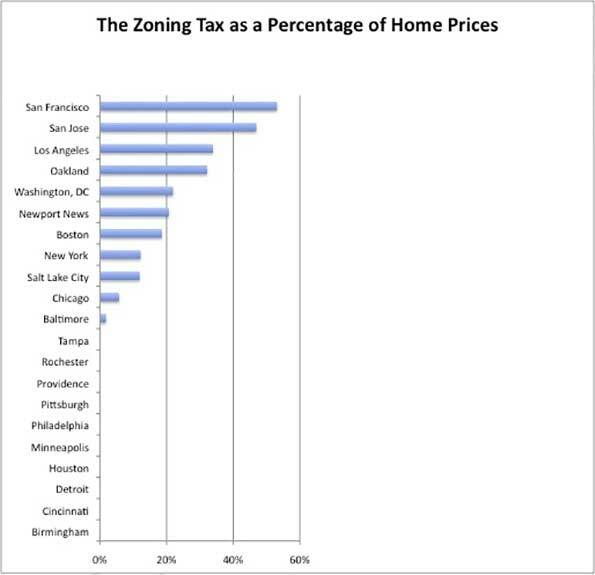 The zoning tax as calculated by Edward Glaeser, Joseph Gyourko, and Raven Saks in “Why Is Manhattan So Expensive? Regulation and the Rise in House Prices” (2003). Policies that increase housing costs have a clear constituency in all homeowners, but they hurt renters and anyone who is hoping to move to an expensive city. The burden of land use regulations are borne disproportionately by low-income people who spend a larger proportion of their income on housing relative to higher income people. These regressive effects of land use policy extend beyond reducing welfare if the least-advantaged Americans. Additionally, rules that increase the cost of housing in the country’s most productive cities reduce income mobility and economic growth. In our paper Sandy and I also discuss proposals for reducing the inefficiency of cities’ current land use regulation practices. David Schleicher has proposed some of innovative policy improvements, including a zoning budget that a city can implement to commit itself to permitting a certain amount of new development. A zoning budget would create a situation in which local policymakers are forced to make tradeoffs between different land use restrictions, as opposed to the current situation in which there is no limit to policies restricting building. Another proposal that Schleicher suggests is a tax increment local transfer, or a TILT. With TILTs, homeowners who live near new development would receive some portion of the additional property taxes that the city raises by allowing the development. The purpose of TILTs is to reduce NIMBY opposition to development. We hope that our paper will be a helpful resource to those looking for an accessible overview of this area of research and point to future research opportunities for institutional reforms to allow for the construction of affordable housing. This piece first appeared at Market Urbanism. Emily Washington is a policy research manager for the Mercatus Center at George Mason University. She manages the Spending and Budget Initiative and State and Local Policy Project portfolios. Her writing has appeared in USA Today, The Christian Science Monitor, Economic Affairs, and The Daily Caller. She contributes to the blogs Neighborhood Effects and Market Urbanism.